The Osteoarthritis Technology Plus Network (OATech+): A multidisciplinary approach to the prevention and treatment of osteoarthritis, fits the EPSRC Optimising Treatment Grand Challenge. 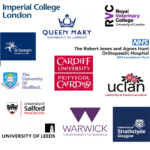 The OATech+ Network is working to trigger the disruptive changes required in these areas by combining over 100 academic, clinical and industry UK and international participants with appropriate experience/expertise. It will facilitate new inter-disciplinary research links and broaden the musculoskeletal (MSK) research arena through technological advances and the application of engineering and physical sciences to biomedical sciences. To direct the research being undertaken, a Research Forum has been established. This is comprised of the Operations Group and Theme Leaders, and includes representatives from multiple UK institutions.